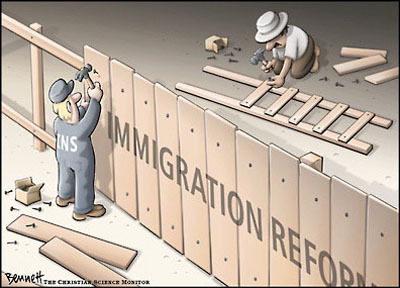 American cartoon about Immigration Reform: the Immigration and Naturalisation Service (INS) puts up its wall. Thanks to the Flying Rodent blog. "This paper is based on interviews with Iraqi refugees settled in Australia and stranded in Indonesia; people smuggling trials held in Australia involving refugees from Iraq; and personal communications." "I start by providing a brief comment on method. After an overview of the journey, I then consider the relations between refugees and smugglers, focusing particularly on questions of trust, exploitation, danger and safety." This paper was presented by the author at the Second Multi-disciplinary Conference of International Association of Contemporary Iraqi Studies (IACIS) Philadelphia University, Amman, Jordan, June 2007. Despite wide-ranging academic interest in Australia's response to asylum seekers, little attention has been paid to migration routes they followed or dangers they faced. This paper considers the relationship between asylum seekers and people smugglers, based primarily on interviews with Iraqis settled in Australia and Iraqis stranded in Indonesia since 2001. The study is responsive to recognition within forced migration research of the importance of giving voice to the main agents - refugees and asylum seekers - as part of the research process. They are indeed the key to understanding the social and community dynamics that contribute to forced migration. Between 1999 and 2001, 13,000 asylum seekers attempted to reach Australia, 5,000 of whom came from Iraq. Most but not all were successful. Typically, they went from Iraq to countries of first asylum such as Iran, Jordan and Syria then transited Malaysia and Indonesia before attempting the dangerous sea crossing from Indonesia to Australia. Many of the smugglers based in Malaysia and Indonesia who facilitated these journeys were themselves refugees from Saddam's Iraq. Using established social and community networks that operated across borders, Iraqis in countries of first asylum experienced little difficulty in obtaining the smugglers' phone numbers. The news that there was a way to reach Australia had spread quickly. The notion of social and community networks implies that a bond exists between people which presupposes a degree of interpersonal trust based on shared norms. Was this the case for the refugees and smugglers? My ongoing PhD research considers the journeys of Iraqi refugees en route to Australia, in which the smugglers played a significant role. It is clear that shared language, ethnicity and experience aided communication and negotiation between them. However, although the refugees placed their trust in the ability of smugglers to help them reach Australia, this should not be taken as an indicator of their faith in the smugglers' integrity or moral character. This paper is based on interviews with Iraqi refugees settled in Australia and stranded in Indonesia; people smuggling trials held in Australia involving refugees from Iraq; and personal communications. I start by providing a brief comment on method. After an overview of the journey, I then consider the relations between refugees and smugglers, focusing particularly on questions of trust, exploitation, danger and safety. Given the absence of previous academic research into the journeys of asylum seekers across south-east Asia but mindful of the wealth of information and richness of narrative from my experience working with Iraqi and other refugees for some years, I elected to use grounded theory as a research method. Unlike other research methods, grounded theory is not premised on testing a preconceived theory or hypothesis but allows the theory to be generated from the data (Glaser & Holton, 2004). In my case, the data came from two main sources: interviews with participants recruited for my PhD and testimony of 36 Iraqi witnesses from one people smuggler trial held in Australia. I interviewed 14 people in Perth, Western Australia and 8 people in Cisarua, West Java in Indonesia. Of the 22, 16 were male and 6 were female. Interviews were conducted in a semi-structured fashion, with participants invited to relate the story of their journey from the time they left Iraq. More than half the interviews were conducted with the aid of an interpreter. Of the 36 Iraqi witnesses at the smuggler's trial, 35 were men. In total I have analysed data provided by 58 people - 51 men and 7 women - all of whom travelled on boats arranged by smugglers. Almost two-thirds (34) travelled with their spouse, children or siblings. Prior to making their way across south-east Asia, just over half (30) had been in Jordan, a third (19) in Iran and almost a tenth (6) in Syria. Most participants and witnesses (49) flew from Iran/Middle East to Malaysia where they were granted short stay tourist visas for two or three weeks depending upon their arrival date. Malaysia is not a signatory to the 1951 Refugee Convention, the key legal document defining a refugee and the responsibilities of states that have signed up to it. Malaysia has no system for addressing asylum claims and a poor record in its treatment of refugees. Being caught without valid papers carried the risk of being subjected to the harsh penalties meted out to illegal immigrants; being fined, lashed, detained, and then deported (see US Committee for Refugees and Immigrants, 2002; 2006). "Ten days in Malaysia, deal with agents to bring to Indonesia. They gave me option; you want to buy boat, visa, passport, go by land, air; multiple choice (P21 2)". A third (18) of the study participants and trial witnesses travelled from Malaysia to Indonesia by boat across the Strait of Malacca to one of the thousands of islands that form Indonesia. One of the world's busiest shipping lanes, the Strait is patrolled by police and navy to counter the very real threat of piracy (Munns, 2004). For some of the participants/witnesses, this was one of the most dangerous stages of their journey. The smugglers had hired local fishermen to land the refugees at deserted Indonesian beaches. "One day and one night by boat...it was dangerous, fighting for self. One step to death. Gods help us. Storm, rainy, boat unstable. Very difficult (P15)". "Boat journey like death, 24 hours. 21 people on the boat. Fishing boat, very small not big enough for 21 people. We changed boat two times. Malaysian boat, put us on bottom of boat, we lay down, covered us with piece of wood maybe 30 centimetres from the ground. Then put goods on top of that. We could not move. Nothing to eat, little girl took milk. Sacrifice ourselves, all trouble just for the future. Boat journey, rainy, stormy, October. Smuggler chose bad weather <as> police don't patrol so won't find us (P20)." Having arrived in Indonesia, unless registered with UNHCR as refugees, asylum seekers were at risk of being apprehended and detained by Indonesian authorities in immigration detention. "Immigration arrested family, 11 months in immigration detention. Arrested in hotel in Mendan day I arrived (P15)." All the Indonesian-based participants and one of the Australian-based participants experienced Indonesian immigration detention facilities. UNHCR secured their release. If not detained, the main concern was securing a passage on a boat going to Australia. According to both the study participants and the trial witnesses, the cost of the journey was negotiated with the smugglers. The per capita cost was highly variable depending on the smuggler, the size of the family group and the financial circumstances of the family, with children sometimes traveling free (W9, W22, W34). A conservative estimate of US$2,000 per passenger for a boat carrying 70 people - the average number of passengers of the 180 boats between 1999 and 2001 - earned the smugglers $140,000. Even after allowing for the smugglers' costs this was a highly lucrative business. Given what they collectively paid, many of the participants/witnesses reported being shocked at the conditions of the boats they were expected to travel on to cross either the Timor Sea or Indian Ocean. Policies and legislation introduced by the Australian government to disrupt the smuggling operations had a negative impact on safety. Smugglers were less able and less inclined to source decent boats when it was known Australian authorities destroyed them after passengers were landed (P1). After Australia introduced longer prison terms for smuggling, juveniles were increasingly used to crew the boats as they would receive lighter sentences (Warton, 2002). Their relative inexperience increased the risk factor. In the latter half of 2001, Australian naval vessels were tasked to intercept asylum seeker boats to make them return to Indonesia. This included firing warning shots. After the SIEV 4 asylum seeker boat was intercepted by a navy ship, its officers requested of their captain that women and children be disembarked due to the condition of the boat. The request was refused. With the ship alongside, SIEV 4 sank two hours later. All the passengers including young children had to be rescued from the sea (Commonwealth of Australia, 2002). The existing small body of academic research on people smuggling syndicates provides a broadly consistent and generally negative picture. While the Australian Federal Police have characterised people smuggling syndicates as criminal gangs, speculating they might also be involved in other criminal activities such as drug smuggling or bringing terrorists to Australia (Warton, 2002), most academic research has suggested that people smuggling syndicates represent loose networks based on kinship or ethnic ties rather than hierarchical criminal gangs. For example, Icduygu and Toktas (2002) research on smugglers operating from Turkey describes networks of individuals operating in countries of origin, transit and destination, linked through kinship or nationality, with the knowledge and contacts to aid migrants, whether economic migrants or asylum seekers, achieve their goals. The authors note that the smugglers tended to deal with people from their own countries, pointing to the significance of interpersonal trust between smuggler and migrant in the continuing operation of the smuggling syndicates. They also refer to the reciprocal nature of the relationship between the smugglers and the migrants; the smugglers only operating because the migrants desired the service they provided. However, as the authors point out, it forms an unequal relationship, with the balance of power firmly held by the smugglers. Similarly Heckmann's European research, which draws upon court testimony and interviews with smuggled people and experts such as police, suggests that the smuggling syndicates concerned were based on ethnicity. He argues that despite shared ethnicity, even kinship, there is an unequal power balance within the syndicates, which typically consist of an entrepreneurial individual at the centre, assisted by a small group of helpers. While mutually beneficial to both the individual and the helpers, the central figure is likely to earn considerably more out of the enterprise than the helpers. In brief, while shared ethnicity added to the stability of the syndicates it did not necessarily stop the entrepreneur dominating or even exploiting the helpers (Heckmann, 2005). "I knew the word 'smuggler' but didn't realise what they are like. Now think of them - just about money, didn't help people, just want money, liars (P3)." "View them as criminal (P6)." "People wait for us outside airport, take us to hotel. Someone come to see us in hotel, ask for money. Just want money, don't care. So I refused to pay. People smuggler wanted a lot of money. I said won't pay till in the boat. Others paid and told me to pay. <But> worried that people smuggler take the money and nothing happen. So I went to the streets and ask in Jakarta. Saw people who'd been there 6 months or 1 year and all tell me different stories (P4)"
Another remembered the losses incurred as smugglers traded on delays and uncertainty. "After arriving in Indonesia October 2000, I try three times to go to Australia. Went to coast, bad storm, cannot go. Another time police and immigration there, cannot leave. Maybe caught, arrested. We pay for three attempts, didn't get money back. Each time we advised by other people about which people smuggler, go to new smuggler and make a deal (P18)." The smugglers' failure to take steps that would have made the inherently dangerous sea crossings safer was an important factor underlying the participants' disillusionment. Furthermore the data suggest that while they smugglers were well aware of the poor conditions of the wooden fishing boats used for the journey from Indonesia to Australia, they lied to the passengers about them. "People smuggler bring video camera and show us the boat, like rich people's boat...old boat, overcrowded, not like on video... I want to get off. Indonesian guys, captain, just had small compass, no radio, no technology on the boat. I thought we were finished, to die (P4)." "Before we see boat, he tell us boat very good, safe condition. We see miserable small boat (P10)." "<The smugglers> brought photos of the boat we were to get on: very large, 2 or 3 storey, five star boat...told us 'you will not get on the boat at the beach. You get on small boats that will take you the next boat, then on that to the main boat'. When we got on the boat, we thought it would take us to the main boat. But it was the <main> boat (P22)"
Three participants reported that smugglers misled them about the duration of the journey. "Got on a boat to Australia. Four days they said. Twenty one days or more (P2)." "They said 30 hours. It was eight days (P3)." "Smuggler told me wrong information, that trip take just 20 hours. We start at 5 in the morning. I talk with smuggler's brother <who is on the boat> after 12 hours, 5pm. He said, if nothing happens, we will be at Christmas Island tomorrow afternoon, 36 hours. When I heard that, I start to vomit, I feel dizzy. Then someone wake me up. 'We're here'. (P11)"
Thirteen participants reported engine breakdowns, leaking boats, getting lost and running out of fuel. The following comments come from two of the four participants who travelled on boats that sank. "Journey to Australia, small boat, 40 people. Travelled 12 hours and boat sank. We in sea at night. Scared to death. 3 year old girl drowned. One friend swim for 20 or 30 metres, saw a fishing boat. The fishermen were repairing the boat. They threw a line to him, and told them "help, help". They send a small boat to collect us, one, two at a time. During that period, little girl drown. Dark, we couldn't see (P21)." "...waves high. Boat began to break up, water started to come in...I was unconscious. I was sitting on the floor and behind me a piece of wood came loose. I was scared, thought I would fall into the sea. We smell smoke and bad smell of burning. It didn't seem that we would arrive... Saw a fishing boat, called to them. 23 Mandeans left... Ship <we had been on> had sunk but we didn't know. We hear police capture the boat, then we hear it sank, then we heard it arrived. We didn't know. We decided to try again to go to Australia. After 2 - 3 days we heard the news, the ship definitely sank, very few survivors 40 - 45...Once heard the news, didn't want to try again (P22)". The general picture, then, is strongly negative. This view is somewhat modified by Chatelard's (2002) research on Iraqi refugees in Jordan. Chatelard notes that while some smugglers took advantage of the vulnerability of the refugees (particularly evident in cases when Iraqi women entered into prostitution at the behest of the smugglers to pay for their onward journeys), others acted for more altruistic reasons. It is similarly evident that some smugglers involved in the journey to Australia have shown concern for asylum seekers of same ethnicity/nationality. At least three UNHCR-registered refugees from Iraq are currently serving sentences in Australian jails for people smuggling offences committed in Indonesia before 2002. Having fled Saddam's Iraq, they became involved with people smuggling after arriving in Indonesia. All claim they did so to help other Iraqis reach Australia safely. Based on undisputed trial evidence, the primary motivation for one was to arrange passages for members of his own family (Queen v Al Jenabi). In the second case, involving a Sabi Mandean smuggler, it was very clear that the smuggler took a particular interest in Mandean asylum seekers (Hoffman, 2005). A prosecution witness at the third trial spoke positively about the motives of the defendant. An Australian national, this witness had befriended the smuggler to facilitate his arrest by Australian police (Queen v Asfoor). Counsel: In fact, at heart, you found him to be quite a decent fellow, didn't you? Witness: In fact, I did, actually, yes. Counsel: His involvement showed to you that he had genuine concern for these refugees, didn't he? Witness: He definitely did, yes. There is no doubt about that. Counsel: And his priority was to get them to the safety of Australia, wasn't it? Four participants / witnesses also praised this particular man. "I have all respect for him (W25)." "Law says not but I say he's good (W3)". "<The smuggler> is a good man (P16)". "<Smuggler> is a good man, if smuggler not stealing then he helps people. <This smuggler>, if people don't have money, he brought them free (P14)." "I knew a friend of the smuggler in Iran. The smuggler rang to check. That friend said he knew me, so I didn't have to pay...I'm scared of the ocean ... I feel trip is safe because <the smuggler's> brother is on the boat (P11)." "After two days, we're in Indonesian waters, broke down, engine, leak...smuggler responsible for the boat...boat blown to the shore. Phone smuggler who brings another motor and pump to get rid of the water. On TV internet, we see <reports that> our boat has sunk. We stay in the sea 23 days...Smuggler come <again> and bring food and new supply, new motor (P10)." All these comments should be set against the dangers inherent in the voyage as described earlier in the paper. Three participants commented that they knew in advance that the boat journeys would be risky. "Very dangerous trip but what can we do. Husband said to me, you know this is dangerous, I said, I agree (P6)." "Just needed to get on; cannot go back to Iran or Iraq; do that, be killed or prison. People rushing to the boat, no one knew how many the boat would hold. <I thought> 'Good, I with my husband and children; if we die, we die together' (P8)." "Never afraid on the way. Whatever on the way, not as danger as the danger I'd been through. I'm heading for safety, peace. Not doing anything wrong. Didn't expect any danger except for the ocean. Only time felt death is very close - if boat broke down, that's it (P12)." When Australia brought in legislation in late 1999 that denied family reunion to thousands of Iraqi refugees in Australia, increasing numbers of women and children attempted the dangerous journey (Hoffman, 2006). Two Iraqi men (P11; community representative to my PhD study) reported that they told their wives not to make the journey as it was too dangerous, but their wives insisted. Living in abject poverty on the other side of the world without the protection of their menfolk was too difficult. "My wife asked me, should I come same way. Because I fear the ocean crossing, not an easy trip, I say NO. She decide alone to come. I sent money for her. She had jewellery, sold everything, furniture...I get letter from Red Cross; my wife and two kids in Woomera 3 (P11)." Such risks were highlighted by the tragedy of SIEV X, an asylum seeker boat that sank between Indonesia and Australia in October 2001. Almost 300 of the 353 passengers who drowned were Iraqi women and children. At least eight men in Australia lost their wives and children when SIEV X sank (Personal communication by Marg Hutton of www.sievx.com.) Those that have spoken out condemn the smugglers but also lay blame at the door of the Australian government for introducing a policy that denied any legitimate means by which families could reunite, by default directing them to the smugglers. "If they allowed us to bring our families this would not have happened...I had lost hope of seeing my children...there was no other way but the sea to bring my wife and four children. But death was closer to them from me (see El Telegraph, 2001)." In summary, participants and witnesses had mixed opinions about the smugglers, with the majority of participants reporting negative attitudes towards them. Although the smugglers were largely successful in fulfilling their part of the deal, that is bringing refugees to Australia, the way they conducted themselves caused considerable distress; the smugglers took money from refugees for sea crossings that did not eventuate or did not reach Australia; the conditions of the boats exposed the refugees to extreme danger; and the smugglers lied about duration of voyages and condition of boats. All these factors undermined the interpersonal trust that might otherwise have followed from shared ethnicity and/or nationality. The study participants and trial witnesses began their journeys from the Middle East having put their faith to some degree in the efficacy of social and community networks. That this may have been undermined by their actual experiences should not be attributed solely to the behaviour of the smugglers. There are a combination of factors, outside the scope of this paper but including the prevailing context of international relations and actions taken by various governments that contribute to difficulties faced by forced migrants. 1 The author gratefully acknowledges Anne Pedersen and Patricia Harris for their input into the paper while taking full responsibility for the views stated herein. The author also acknowledges Sustainability Pty Ltd and Murdoch University, both of Perth, Western Australia, for their support in the form of a Partnership Program grant. 2 P1 to P14 refers to the 14 study participants living in Australia, P15 to P22 to the 8 study participants living in Indonesia. W1 to W36 is used to identify the 36 trial witnesses. 3 Woomera was an Australian immigration detention centre. Editor's note: for this online publication some extraordinary long online locations (URL's) have been replaced with replacement 'short' URL's. Availability of these online references is not affected by this decision. Chatelard, G. (2002). Iraqi forced migrants in Jordan: Conditions, religious networks, and the smuggling process. Paper presented at the WIDER Conference on Poverty, International Migration and Asylum, Helsinki. Retrieved from the web 2 Dec 2006. Commonwealth of Australia (2002). A Certain Maritime Incident Report by Senate Select Committee. Retrieved from the Web 2 May 2007. El Telegraph (2001). He Lost 14 Members Of His Family In The Ship Catastrophe Retrieved from the Web 18 May 2007. Glaser, B. & Holton, J. (2004). 'Remodeling Grounded Theory'. The Grounded Theory Review, Vol. 4, No. 1, 1-24. Hoffman, S. (2005). Notes from Trial of Khaleed Daoed May/June 2005. Retrieved from the Web 7 May 2007. Hoffman, S. (2006). Temporary Protection Visas and SIEV X. Retrieved from the Web 7 May 2007. Munns, D. (2004). Rise in Murders, Kidnappings at Sea Makes Piracy a Top Naval Priority Worldwide. Retrieved from the Web 2 May 2007. Queen v Al Jenabi (2004). The Queen and Al Hassan Abdolamir Al Jenabi (Sentence) Supreme Court of the Northern Territory Retrieved from the Web 20 April 2007.